Having lived in poor conditions for years and having lost their houses and lands after a flood destroyed their village in Vietnam’s Lai Chau province, Hmong refugees in Vietnam are welcomed by a Catholic community. Experiencing the catholic solidarity and generosity by receiving food, basic goods as clothes and blankets, as well as spiritual support, many ethnic Hmong individuals are deciding to embrace the Catholic faith. Joseph Sung A Phia, an ethnic Hmong, decided to embrace Catholicism after members of the faith fed and clothed him when he was left destitute by floods that destroyed his home in Vietnam's Lai Chau province. It wasn't just their generosity that sparked his conversion, however. He said the experience of having Catholics open their arms to him and his family, despite the fact they were not Christians and were dressed in ragged clothes, showed him how this was "a religion of love." "I am very happy to know God and to have become one of His children. I hope to spend the rest of my life praising and honoring Him," the 77-year-old told ucanews.com in broken Vietnamese. "We are extremely grateful to those Catholics who consoled us and offered us food, clothes, and blankets, and allowed us to stay with them after severe floods damaged our home last June," he added. His neighbors say he rarely leaves home without a rosary around his neck nowadays, and that he regularly attends community prayers on weekends at the house of a Catholic family in the community. Phia's family was among 10 Hmong families baptized by Father Peter Phan Kim Huan at Lai Chau parish on Dec. 19. The number of baptized stood at 62 in total. They hailed from mission stations in Ho Mit and Trung Dong, in the province's Tan Uyen district. That meant the newly converted parishioners had to travel 70-100 kilometers to attend the baptism. Since the mission stations were established at Christmas in 2016, the number of Hmong Catholics who attend services there has jumped from 70 to 230, Father Huan said. The priest, who provides pastoral care for 2,400 local Catholics, said many faithful gather at people's houses to pray on Sundays because they have no chapel. The authorities in this officially atheist, communist country do not recognize religious activities nor allow priests from other jurisdictions to pay pastoral visits to people in other areas. "They show how strong their faith is by courageously erecting altars in their homes to praise God, by removing old altars, and by wearing rosaries around their necks," he said. They teach Catechism to one another in their native Hmong language and spread their faith to friends and relatives, he added. Father Huan, 62, said Hmong Catholics appreciated the church's efforts to help them overcome many of the difficulties caused by last summer's floods. Some 50 households had their houses destroyed. In the wake of the floods, the authorities bent the rules by letting the priest pay visits to offer humanitarian aid. He also led benefactors from other areas to pitch in. "We built 14 houses for those whose homes had totally collapsed due to all the flooding. Each house was at least 50 square meters and cost about 90 million dong [US$3,900], " Father Huan said, adding the bill was picked up by Caritas Vietnam, the church's social arm, and other benefactors. Providing basic supplies for victims of natural disasters was proving to be the most successful way of evangelizing in the area, he said. Joseph Sung A Dua, 40, said his nine-member family had to stay in a six-square-meter tent and suffer from the elements for months after the floods passed. "Father Huan built a new 60-square-meter house for us last month. We are thrilled to live in such a big place with a working toilet," Dua said. "God sent Father Huan to help us in our time of need, so we believe in God and follow Him." The rest of Dua's family converted to Catholicism in December. Father Joseph Nguyen Tien Lien is the pastor of Mai Yen parish, which serves 1,200 Catholics in the neighboring province of Son La. He said 50 Hmong, excluding children, embraced Catholicism over Christmas 2018 alone. That takes the number who have converted since he began working with them in October 2017 to about 250, he said. Church workers focus on charitable activities and ways of improving the lives of local people in remote areas, he added. But not all of the Catholic communities in the province have received formal approval from the government, he noted, despite Hung Hoa Diocese clamoring for such recognition for the past decade. Father Peter Pham Thanh Binh, head of the diocesan Committee for Ethnic Minorities, said his diocese prioritizes serving ethnic groups who are mired in poverty. It now serves a quarter of a million Catholics in nine mountainous provinces. The church has won the hearts and minds of people who formerly viewed Catholicism as a "foreign religion" by building concrete roads, houses and other facilities, and supplying them with power and potable water, he said. It has also provided access to emergency aid, education, and health care for those living in remote areas, he added. as a way of encouraging them to evangelize. Some priests estimate that as many as 1,000 Hmong from the five provinces of Dien Bien, Lai Chau, Lao Cai, Son La and Yen Bai joined the church in 2018. 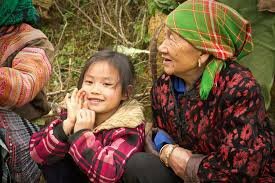 There are now about 1.2 million Hmong living in Vietnam, according to the calculation of various groups. They are not included in the official census. Father Huan said many Hmong have turned to Catholicism because they seek support in times of difficulty, and the church delivers on both the material and spiritual level. "They completely trust in God's providence, they love and help one another in difficult situations, and they are optimistic about the future," the priest said. Phia said he used to offer food and burn incense to the ghosts of his ancestors whenever one of his relatives fell ill, part of a traditional belief system to enlist their help in the afterlife. "Now I believe I will be with God in Heaven after I die," he said.